Turkeys have been kept for many years for their fine table qualities. Black turkeys were introduced to England as long ago as the early 1520’s from Spain and later became known as Norfolk Black turkeys, named after the county of Norfolk where they were kept and became popular for their table qualities. The Norfolk Black was one of the first to be standardised in the UK. There are now 10 varieties of turkey standardised in the U.K. and 8 in the U.S. where they are called heritage varieties. Sadly some of these are facing the threat of extinction. Many could easily be lost without breeders becoming interested in keeping and breeding them. 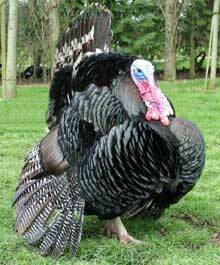 Turkey Club UK produces breed standards and promotes the conservation and keeping of turkeys. Our Turkey Forum provides a place to meet and ask these if you are interested in turkeys. Turkeys aren’t just for your Christmas lunch! More and more people are realising that keeping turkeys as pets can be very rewarding since they have such great characters and are not difficult to keep. They are certainly impressive creatures to look at, are inquisitive and docile and can become very friendly. Keeping turkeys is fairly straight forward, providing you have sufficient space (a large garden is usually big enough for a trio of turkeys) and follow some basic common sense rules. Frequently Asked Questions about keeping Turkeys. From what to feed turkeys to housing requirements, this section should answer your most commonly asked questions. This section contains general articles about keeping turkeys that don’t belong in any other category. There is a range of information about how to keep turkeys in this section.